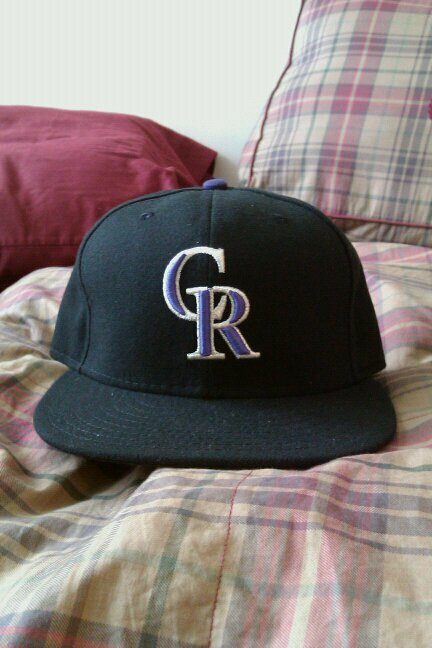 This is the cap of the Colorado Rockies. The Rockies, as you may or may not know, is the Major League Baseball franchise which was one of two expansion teams in 1993 along with the Florida Marlins. The Rox, as the locals call them, played their first few seasons at Mile High Stadium where the Denver Broncos played their games as well until their own ballpark opened the following year. Coors Field opened to start the '95 season and has been a fan favorite around the league ever since. The park seats 51,262 fans for a full game, and has been host to 3 playoff seasons; 1995, 2007, and 2009. Their most successful season came in 2007 when they reached the World Series against the Boston Red Sox, but fell short in 4 games. In their short history, they have had some big time names wear the purple pinstripes; Players such as Dante Bichette, Larry Walker, Vinny Castilla, Andres Galarraga, Eric Young, and the always popular Todd Helton. This past season, I took a trip to The LoDo area of Denver to take in a few games in the thin air. While enjoying the beautiful park and the even better scenic backdrop of the Colorado Rocky Mountains, I took some time to check out the team store and pick up this fitted. The cap shown has a black crown, a black brim, and an interlocking C and R shaded purple and laced with a silver lining. This cap is not necessarily a classic yet, but it definitely possesses a crisp clean look that fits the bill. This cap can be found at the Lids site, which I'll link below. Great city, great ball park, and a pretty solid cap.